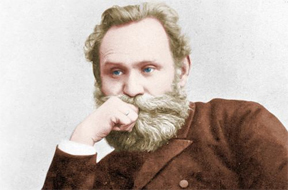 One of the greatest scientists of all time, Ivan Pavlov (1849-1936), was greatly revered throughout the world, and especially in his native Russia. His experiments, conducted primarily on dogs, showed how the brain influences the various conditions of the body and how it controls the functions of the body. His experiments on the use of “conditioning” (i.e. an external stimulus) helped show how dogs’ brains react. For example, Pavlov demonstrated that the brain will introduce hormone secretions to the salivary glands for a dog to salivate when the brain tells the dog “it is hungry.” His research was how the brain worked, and how some external changes might influence how the brain would react. When the Communists seized power in Russia in 1917, the leader of the new Communist government, Vladimir Lenin, took a very serious interest in Pavlov’s works. What Lenin wanted from Pavlov was how his research could “change the brains” of humans. Lenin was looking for some “scientific” method of changing those considered “enemies of the state” and making them into new “citizens.” Pavlov provided information on his experiments, and how he influenced the reflexes of dogs. The Communists used this research on humans. The Communists had set up the slave labor camps in 1918, and threw tens of thousands of people they considered disloyal to the regime into them. They then applied Pavlov’s techniques by denying a certain amount of food to try and influence the minds of the prisoners. Unlike Pavlov’s research, the Communists experimented on human beings and had no problem killing people or letting them die of hunger, exposure to harsh climate conditions, and outright torture. The Communists became so convinced that they could scientifically “change the minds of people” that they developed methods we would later call brain-washing, or conditioning. For the Communists, people were useful as guinea pigs, and it did not matter how many people died—the Communists studied the results. The Communists deprived people of food, warmth, and other necessities if they did not “cooperate,” and increased the amount of food, comfort and other necessities if they did “cooperate.” This inhuman research was conducted on a colossal scale in the former Soviet Union, and eventually in other Communist states against those who were deemed enemies of the state. The goal was to create a “new person” who did what they were told, and did not question or go against in any way the dictates of the state. This has, of course, led to hundreds of millions of broken and scarred individuals whose lives were never the same (at least those who did not die). Interestingly enough, Pavlov himself was against this. He made it clear in letters be wrote to the Soviet government (a dangerous thing to do) that he was against experimenting on humans, and using his research to destroy human beings. That Pavlov wrote such letters to Lenin and then to the brutal dictator Josif Stalin showed that Pavlov not only was a brave man but that his stature in the Soviet Union was very high. Lenin and Stalin ignored his letters and his protests. They used Pavlov as a figurehead for their “scientific socialist” ideas and kept Pavlov as a virtual prisoner. The Communists gave Pavlov a good deal of resources, a comfortable home, and at least the best laboratories in the country. But Pavlov had no freedom and no way to leave the Soviet Union. When he died, the Communists gave Pavlov a state funeral. The sad thing is that the Communist perversion of Pavlov’s ideas continues to this day, especially in the labor camps and now psychiatric hospitals in China, Vietnam, and Cuba. It is a perversion of science that should be considered a crime against humanity.